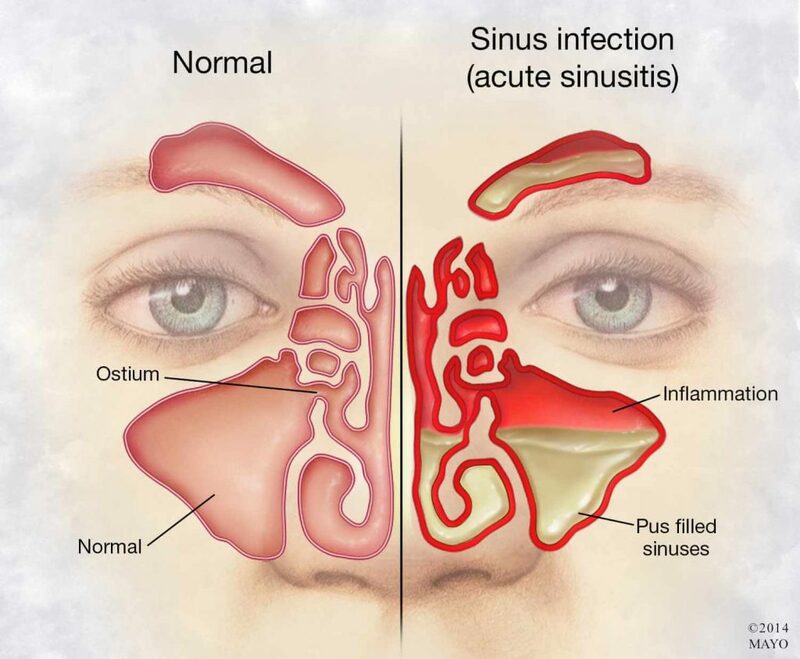 acute sinus infection, Chronic sinus infection, How Can I Treat Sinus Infection?, recurring sinus infection, salt therapy and sinusitis, subacute sinus infection, types of sinus infections, What is a Sinus Infection? Winter is the best time to get a cold. No matter how many blankets you sleep with, or how many layers you put on before going outside, you’re bound to get sick at least once during the winter season. This is because our immune systems are low, making it very easy for bacteria and viruses to attack the body and make a small cold last up to weeks, or worsen the condition into something else. A sinus infection, also known as sinusitis, is the swelling of your sinuses. Sinuses are cavities in your body that produce mucus. Your nasal passages need this mucus to do their job properly. You usually think of mucus as a bad thing, but it’s important to have some mucus in your respiratory system. Mucus helps trap incoming dirt particles from entering your body. When these cavities are infected, it barricades the flow of your natural nasal secretions. This means the mucus can’t get to the dirt particles, therefore allowing the bacteria to grow and make your condition worse. Symptoms of a sinus infection depend on the individual, and it’s very easy to misdiagnose a sinus infection as a cold because of the typical symptoms like a cough, sore throat, and nasal congestion with thick secretions. A small but distinguishable symptom between a cold and a sinus infection is that a sinus infection will affect all areas of the respiratory system. A cold isn’t like that, sometimes only your nose and throat may hurt. Sinus infections branch off into four different categories: acute, subacute, chronic, and recurring. Acute sinus infections are the mildest of them all, and usually dissipate on their own without the need for medication. This type of sinus infection is usually mistaken for a cold since the symptoms are the exact same: headaches, congestion, sore throat, and weariness. Acute sinusitis also lasts as long as a cold, about seven to ten days. Subacute sinus infections are the same as acute sinus infections, only having symptoms last four to eight weeks. This can make the process of healing very tiresome and irksome for the individual, so medication is highly recommended at this level of the infection. Chronic sinus infections are when the infection has been in your body for over twelve weeks. This type of sinus infection also has harsher symptoms such as loss in sense of smell, facial pain, and intense headaches. Serious medications like steroids and saline rinses are brought in at this stage. Last but not least, a person is diagnosed with recurring sinusitis if they’ve had three or more acute sinus infections over the course of a year. While recurring sinus infections aren’t as severe as chronic ones, antibiotics should still be taken, and the patient should still be supervised so that their condition doesn’t degenerate. How Can I Treat My Sinus Infection? There are many options to treating a sinus infection. As previously mentioned, antibiotics are highly recommended for the more serious cases. However, while those help to fight the infection internally, some medications don’t always do enough for the symptoms you’re feeling. A natural treatment that has shown to help is salt therapy. Salt therapy is a non-invasive option to relieving your symptoms almost instantaneously! Salt therapy works in a very simple way. All you do is sit and breathe in microscopic salt particles. When these salt particles enter the respiratory system, it’ll begin to break up and loosen the mucus that’s been making you so congested and you’ll be able to blow or cough it out easily. The salt doesn’t just loosen the mucus. Salt also contains anti-inflammatory properties. This will help reduce the irritation and swelling in the sinuses. By targeting the core problem, the other symptoms won’t be as severe as they were before and eventually disappearing altogether. Once you start doing salt therapy frequently, it helps boost your immune system. This lessens the chance of getting another sinus infection in the future. The best part about this treatment is that you don’t even have to leave your house to do it. A purchase of a salt machine can bring salt therapy into the comfort of your own room. All you would have to be doing is relaxing, and letting the salt do its job. With the help of salt therapy, you’ll be feeling boisterous again and ready to get back to your normal activities. Try salt therapy today and see for yourself how good you’ll be feeling again all because of tiny salt particles.